Today I reinstalled my development virtual machine. For a couple of ‘legacy’ software packages I must have Visual Studio 2005 installed as well. Debugging one of those software packages mentioned above, I wanted to ‘hack my runtime’ using the Immediate Window. It wasn’t there! Since I always have the Immediate Window activated, I cannot remember the shortcut for it (Ctrl+Alt+I ). Looking for the menu item to activate it (yes, of course, in the Debug menu) it appeared to be gone. Sadly this is a known bug. The only way to get it back into the menu is using the Tools menu, click Customize, select the Commands tab, choose for Debug commands and drag Immediate onto the toolbar. 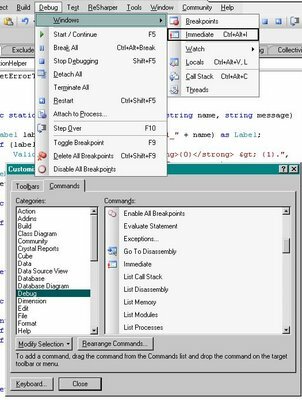 This entry was posted in bug, immediate window, visual studio 2005 and tagged bug, immediate window, visual studio 2005 on December 19, 2008 by Bert Loedeman.